So who doesn’t love Italian food? I adore it, especially when it is authentic, freshly prepared, and everything used in the kitchen is top quality local, national and imported ingredients. Head chef at Agostinis, Francesco Balestrieri, rightly prides himself on having sourced the best he can find: from local olives, Tasmanian beef, through to the 100 kilograms or so of imported Italian cheese used each week! 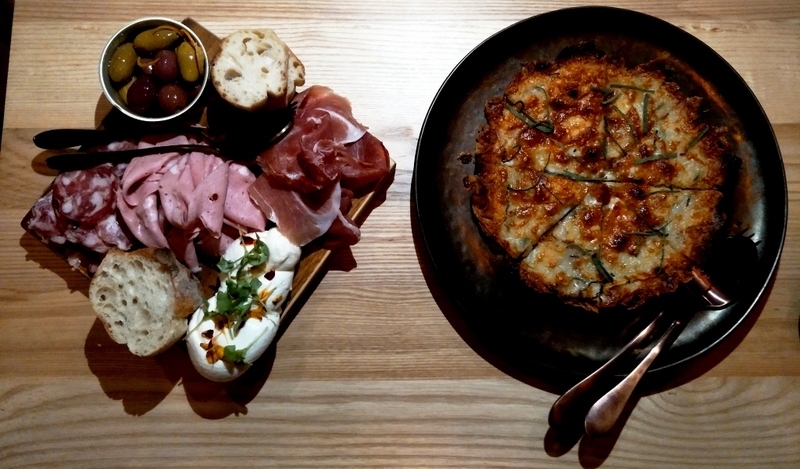 With pasta made in the kitchen every day, delicious slow-cooked dishes, and the Roman-style thin and crispy crust pizzas, Agostinis has landed firmly on its feet and has been busy since opening over a month ago. 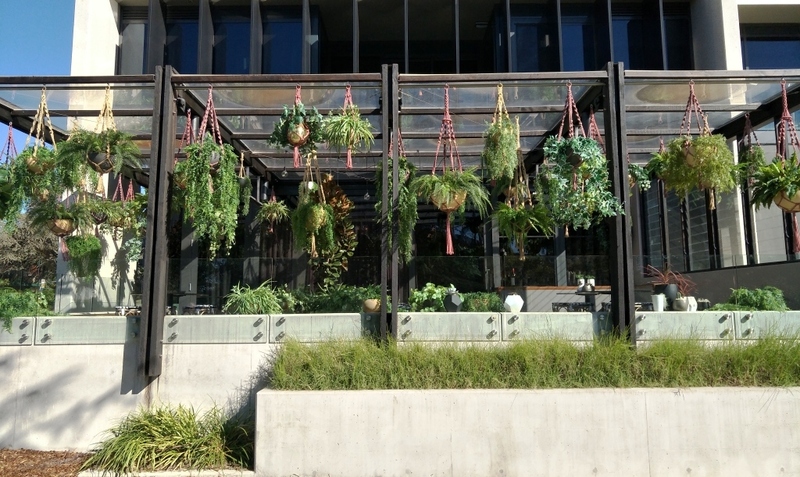 Combine this with an easy walk from anywhere in the inner south, including Manuka, the Parliamentary Triangle and National Institutions, and the sometimes over-rated Kingston Foreshore, I think I am probably not the only one who feels a culinary love affair developing. I visited on a Wednesday night, but at Agostinis there was a distinct Friday night buzz. I arrived in time to bags a prime table in the snazzy bar area: a very comfortable leopard print booth with plenty of room for four, even though there we were only two. 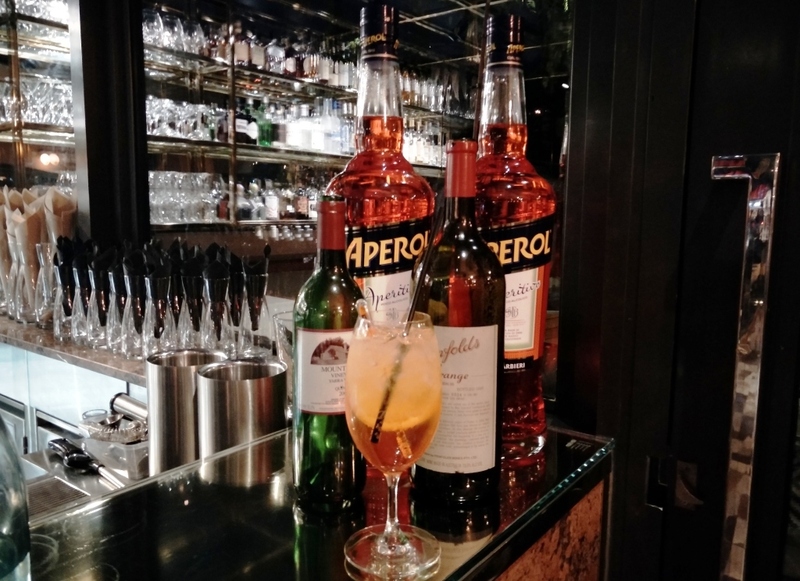 We were persuaded to indulge in the cocktail de jour – Aperol Spritz. Aperol is noted for its bitter orange flavour, and was mixed with prosecco and soda (tonic water by request and I will try next time). It was a perfect start to our evening. The bar was in full swing and very ably managed by bar-meister, Simone, who kept up with the demand for cocktails, as well as keeping an eye on service at his end of this very busy restaurant. How can I describe Agostinis? It’s big (especially for Canberra), it’s airy, it’s spacious, and it offers a variety of dining areas, seating styles, and lighting levels. The lighting has been thought through carefully: mood lighting in the bar, and subtle but a good level of light in the main dining area. The interior ambiance is funky chic. 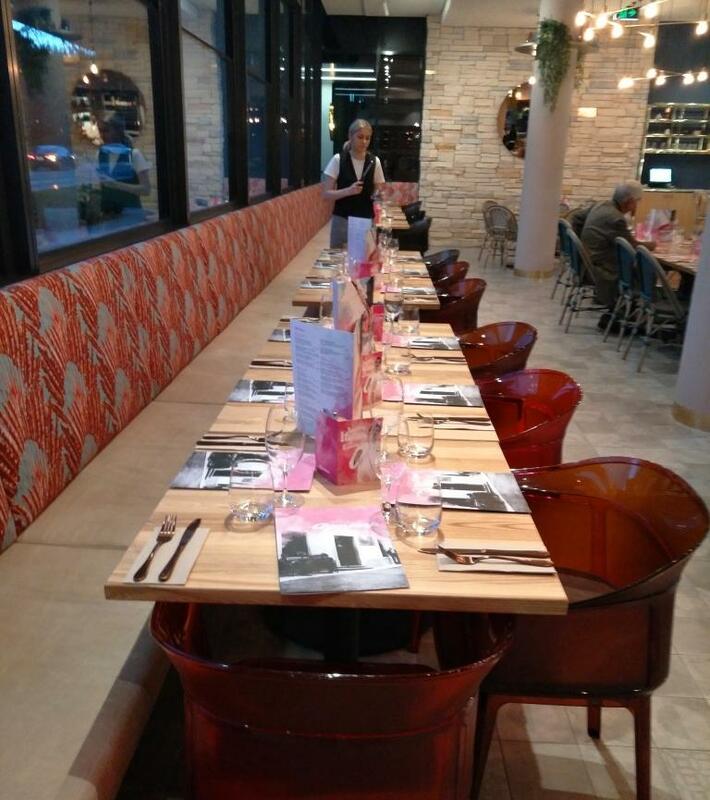 With a deft feminine touch, which I am told comes from Marisa, the mother of owners Dion and Dan Bisa, pink is the leitmotif for the décor, with elegant touches used in furnishing fabrics, menus and branded tee-shirts for the waiters. It is handled so subtly you almost don’t notice it. One wall features a large photographic mural of a much earlier version of Agostinis. the former family restaurant in Italy. Depending on your mood, you can choose to sit in the bright main dining room or if you are on your own or dining with a curious foodie, the marble-topped kitchen bar is a great place to watch all the action. 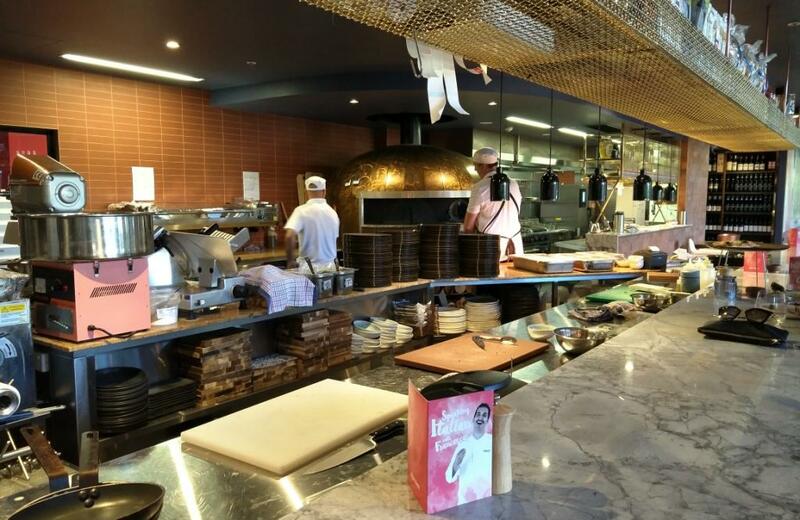 I was intrigued by the amount of activity and equipment, from the gelato-pink fairy floss machine to the industrial sized pasta machine, large stacks of pizza trays and the very glitzy pizza oven that can cope with a staggering number of pizzas. This includes the already legendary Mamma Mia pizza – something for all the family to share and at a metre long, it can feature up to three different varieties of topping. So what is on offer on the autumn menu at Agostinis? To start, the antipasto features three delicately flavoured salt-cured types of meat, olives prepared in-house and quite the most delicious plaited mozzarella ever tasted. This paired nicely with a plate of Frico, an Italian alpine region potato and cheese dish, scattered with fresh sage and perfect for a cold winter night. 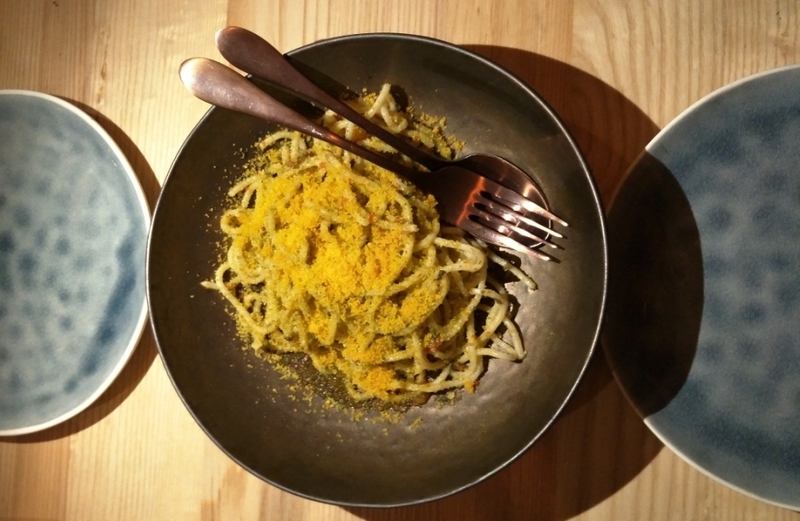 I also tasted another house favourite that already seems to have achieved iconic status – Tonnarelli alla Bottarga. Bottarga may be unknown to some, but this delicious salty, cured fish roe, stirred through the pasta with garlic, chilli, lemon and parsley is a true Sicilian delicacy. Another highlight has to be the Roman-style pizza. I first had pizza at a dinky little hole-in-the-wall trattoria in Kings Cross called Mamma Maria back in the early 1970s. Mamma’s pizzas were thin, and served hot and crunchy with simple ingredients. Sadly, the true art of making pizza seems to have been lost by many pizzerias: pizza dough that hasn’t sat for long enough, over-salty tomato base, with way too many ingredients, often stretching one’s spirit of adventure. The result is often a soggy bottomed base that can only be consumed with a knife and fork. I asked Francesco about Agostinis’ pizzas. These are authentic Roman-style pizza with a simple thin and crunchy base that you can pick up and eat with your fingers. Francesco explained the process of making his Roman-style pizzas. The base contains 220 grams of flour, is mixed with yeast and allowed to sit for 72 hours to ferment, which in turn produces a firm thin crust. 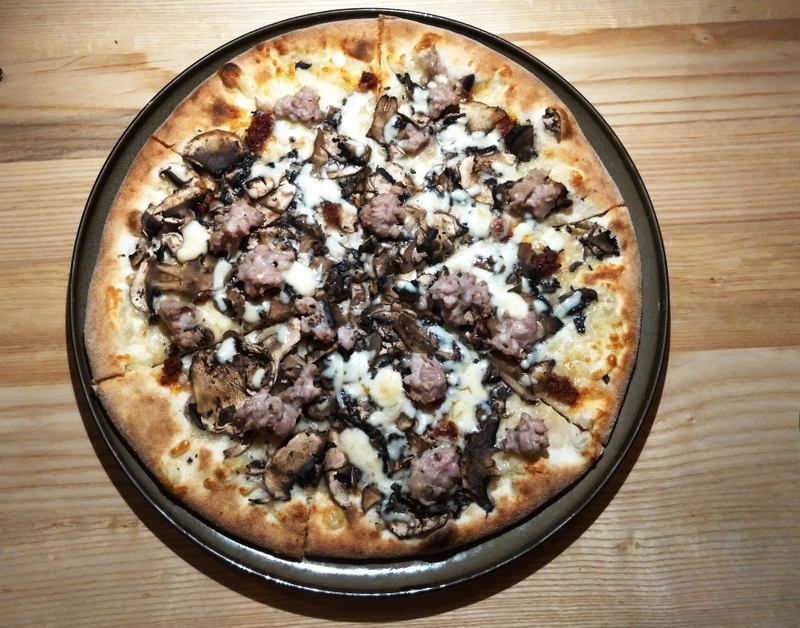 We tried the Pizza Boscaiola with Italian pork and fennel sausage, mushrooms and scamorza cheese. It was excellent! There are good vegetarian options. On a second visit, I enjoyed Pizza Melanzane (eggplant, chilli and squacquerone cheese) with a most delicious Rucola della Casa, a super fresh and tangy rocket salad served with finely sliced apple and parmesan chips: one of the best salads I have had in some time. Desserts are very tempting: Maritozzo con gelato featuring vanilla and nutella ice-cream was appropriately described on the menu as ‘a sandwich made in heaven”. 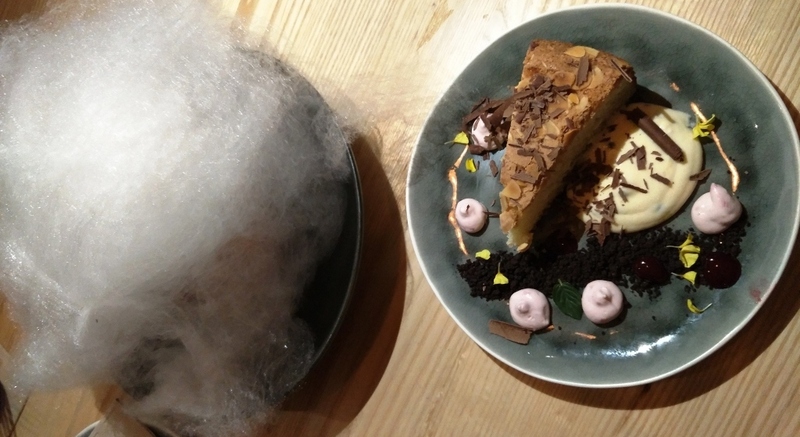 Hidden under a fluffy cloud of fairy floss, this disappeared quick smart. The fresh daily offering of Torte della Casa, varies, but we loved the moist almond meal and coconut cake accompanied with flavour bursts of raspberry, lemon and chocolate. 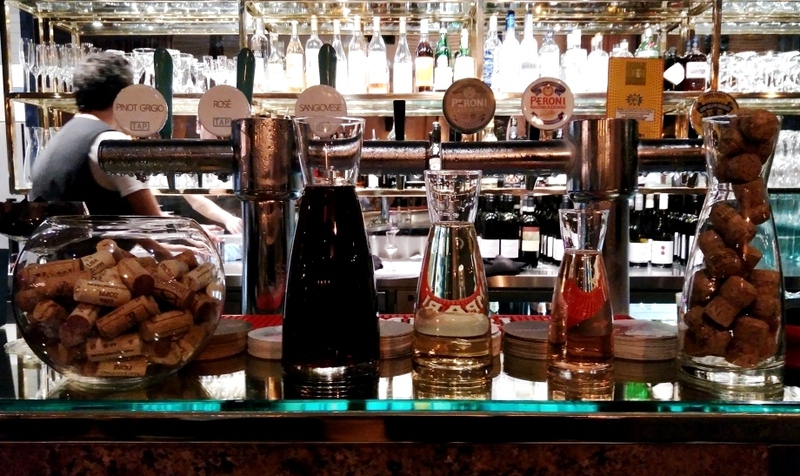 The wine list was balanced, with local and imported wines, but what I found most appealing was the excellent wine on tap. Pinot grigio, rose and Sangiovese are on offer and come in three carafe sizes: a dinky little quarter-litre, half-litre or litre. Lunch hours are 12 to 3, which means Agostinis will become one of the very few Canberra restaurants that encourages a long lunch. 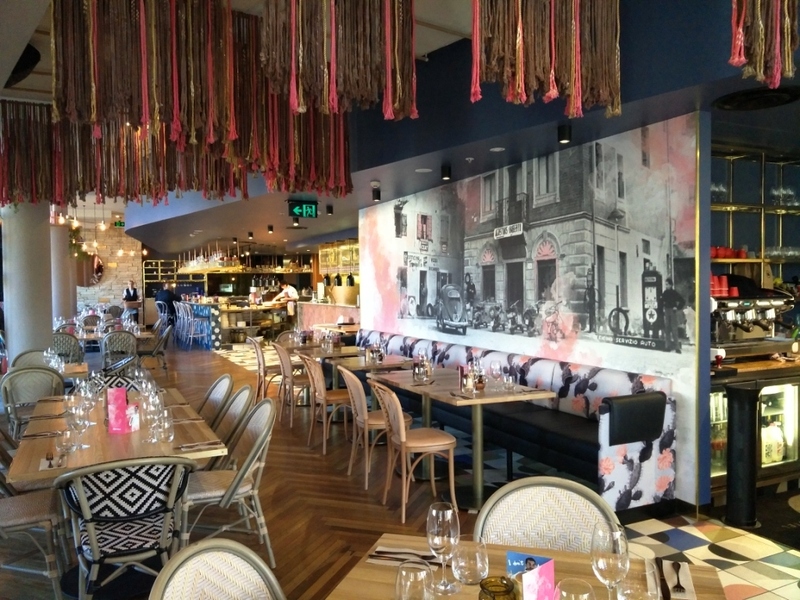 The early opening in the evening means Agostinis can comfortably deal with two sittings, although large tables will generally be given more time. There is space between the tables for high chairs (and there was a row of four waiting for junior foodies) and there is a pretty side terrace as well as tables outside facing out onto the street with gas heaters. I think it will take many visits to Agostinis before I am able to decide where I like to sit best. 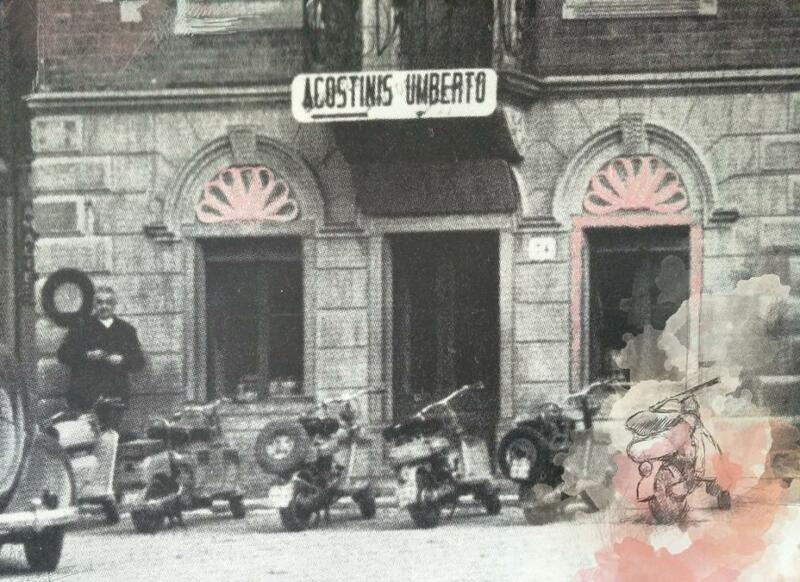 Agostinis is a fine family-run establishment and offers much to please; especially the friendly, but impeccable service. Head chef Francesco Balestrieri is rightfully proud of the carefully structured menu and I think many will agree Agostinis is a great new addition to Canberra’s booming restaurant scene. Although this is a large establishment, it is not hard to believe that in the very near future, bookings will be hard to come by. There are so many reasons to go back again. I suspect with Federal Parliament back in action, Agostinis is going to get very busy, so don’t forget to book! So where to next for this already very popular establishment? A new winter menu is promised for August, featuring that great Canberra favourite – truffles. Bellissimo! Agostinis @ East Hotel, 69 Canberra Avenue, Kingston is open seven days. Lunch 12 – 3 and dinner from 5.30. 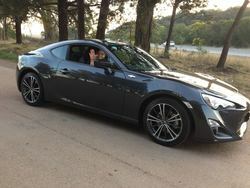 You can book on 6178 0048 or online at www.agostinis.com.au. Parking is available underneath in the East Hotel car park and there are two-hour parking zones in adjacent streets during the day. 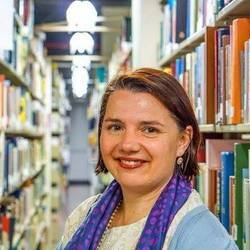 The writer was a guest of Agostinis for dinner but enjoyed it so much she went back for lunch the next day with friends. I think price is a fairly important thing to mention when reviewing places to eat. Traditional print media usually includes prices in reviews as not all readers necessarily have direct access to the internet. Digital reviews on major foodie sites such as Delicious and Traveller don’t include prices, but provide a hyperlink to the restaurant website where readers can review the most recent menu and prices. Agostinis very conveniently provides both their menu and wine list on their home page and there is a link at the bottom of this article. Anyone who can’t afford direct access to the internet will be unlikely unable to afford much on the bill of fare at these establishments, maybe a grissini stick. Traditional print media usually includes prices in reviews as not all readers necessarily have direct access to the internet. Digital reviews on major foodie sites such as Delicious and Traveller don’t include prices, but provide a hyperlink to the restaurant website where readers can review the most recent menu and prices. 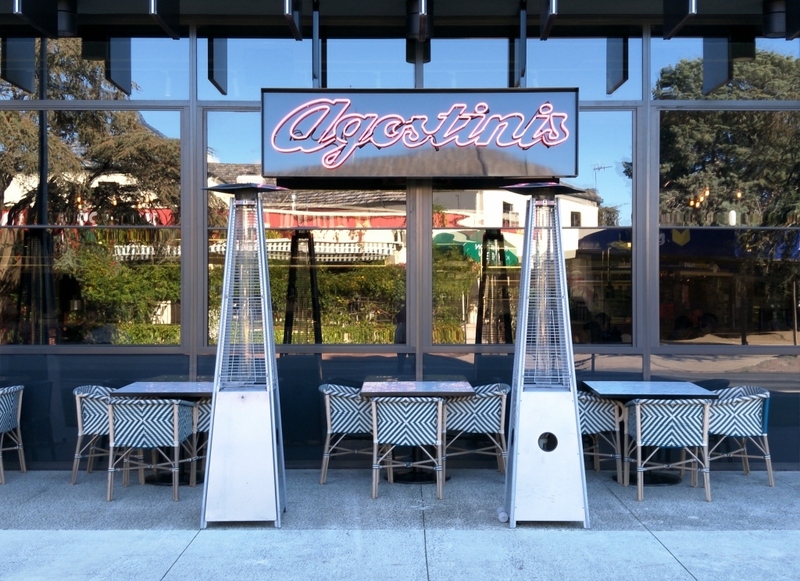 Agostinis very conveniently provides both their menu and wine list on their home page and there is a link at the bottom of this article. This looks fabulous:) I will have to go there.